Traumatic brain injuries are the leading cause of death and disability among children and young adults in the United States with an average of 4,100 individuals sustaining a brain injury every day. Management and care for these injuries varies, but a team of researchers at Southern Illinois University Carbondale are looking at a specific treatment plan that may help to address the complex issue. Kaylee Stillwell, a pre-med senior with a double major in physiology and psychology, is examining how the combination of a certain chemical, along with an enriched environment, might effectively treat children with brain injuries. 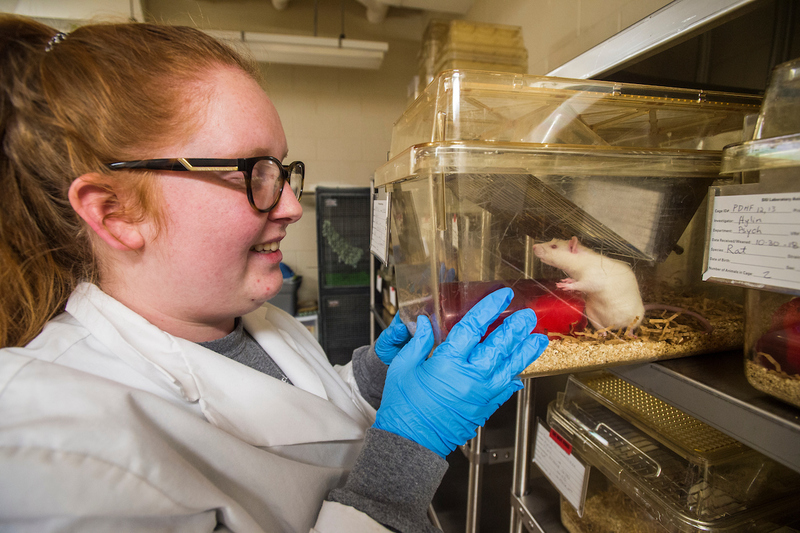 Under the guidance of Michael Hylin, assistant professor of brain and cognitive sciences, Stillwell has spent her semester working with lab rats to determine if the addition of this chemical, 7,8-Dihydroxyflavone (DHF), in correlation with an enriched environment affects the rat’s social and cognitive functions. A naturally occurring flavone, DHF is commonly found in fruits and vegetables, but is rarely absorbed just by food digestion. However, the drug itself is special because it not only targets receptors in the brain that are associated with growth, but it also passes the challenging blood/brain barrier. Additionally, this compound stuck out to the team, as its risk for negative effects is quite low. While the drug is not new in the medical world, this specific use is different from previous studies. “We didn’t discover the compound, but our use of the compound is what’s novel,” Hylin said. Stillwell and Hylin’s research specifically focuses on children, making the study a bit more specific and unique. “Since children’s brains aren’t fully developed yet, it [brain injury] affects them a little bit differently,” Stillwell said. The goal is to combine the DHF drug with an enriched environment to build a holistic treatment experience. By combining the drug use with an enriched environment and mental stimulation, the team expects to see higher recovery of social and cognitive function in adolescents. The study first began with Hylin and a prior student examining the uses of the DHF compound. As Stillwell was assisting them with the study, she noticed a gap in research regarding frontal lobe brain trauma. Surprisingly, frontal head trauma is not very well understood or researched, which is interesting since the majority of head injuries do affect the frontal lobe, Hylin explained. Frontal lobe injuries tend to deal more with your personalities and can contribute to individuals acting more aggressive or dominate. The goal of this study in juveniles is to understand these behaviors, and find a combination treatment that works to unravel the damage. “I hope that it shows a change and effect that would be beneficial for the future to use as a treatment for brain injuries,” Stilwell said. This type of drug and medical research is often a long process before it ever reaches clinical trials. However, constant study, persistence and patience can one day lead to successful treatment of children with brain injuries. At this point, the research is contained to lab rats, which in general work as a good comparison for frontal lobe studies. The team at SIU hope to continue examining the treatment plan to see if it passes for the next step of trials. Stillwell received a 2018 REACH award to support the development of the research. 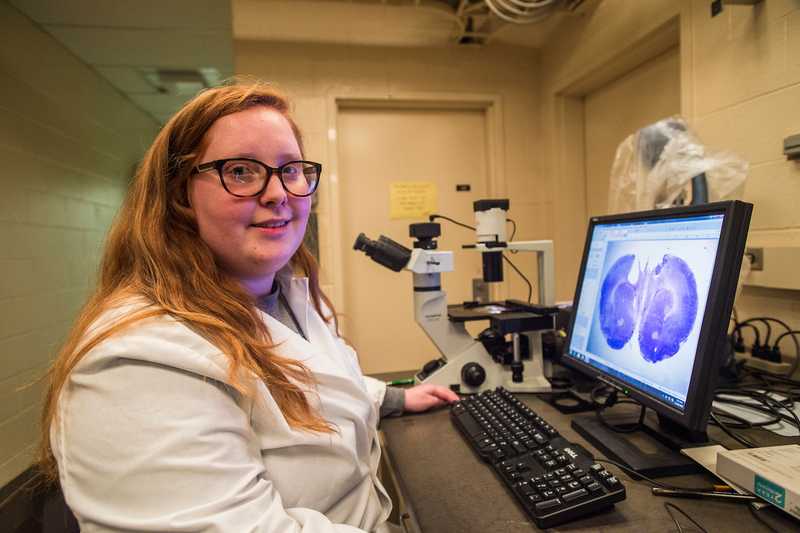 In addition to her research, she keeps busy working on her minor in chemistry, and participating in the Alpha Chi Sigma fraternity. After graduation, Stillwell plans to return to her hometown area of Orlando, Florida, where she will pursue a medical degree. Stillwell sees this research as a foundation for her future, with the goal of one day becoming a research doctor.